Swiggy users are in for a special treat. Start this year with your favorite food. 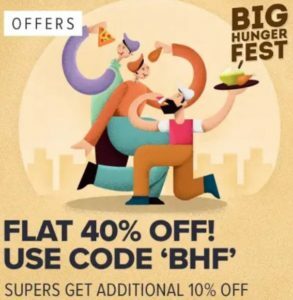 Order food from swiggy and get flat 50% off (up to Rs 100) for Super members and 40% off (up to Rs 75) for regular members. With that pay with Amazon Pay to get additional cashback in your Amazon Pay account. Don’t wait. Order now. How to Get flat 50% off for Super members and 40% off for regular members? 6. You’ll see a success message and applicable discount will be waved off of your total payable amount. 7. Now, choose any suitable payment method. Choose Amazon Pay for additional cashback in your Amazon pay account. 8. Voila!!! Enjoy your food at ease. Super users get 50% off up to Rs 100. Normal users get 40% off up to Rs 75. Offer valid only on selected restaurants only. Respective promo code to be applied to get the discount. Valid unlimited times per user. Valid on all modes of payments. Offer valid till 13th January 2019 (inclusive). Coupon code can be applied only once in 2 hrs. This code can be used unlimited times. It’s just this coupon code can be applied only once in 2 hrs. We have updated the TnCs as well. Please check.